A few French recipes have crossed the Atlantic. Among them is ratatouille, a recipe from the south, and more specifically from Nice (rhymes with “peace”). I have yet to find a French cookbook without a recipe for ratatouille. It’s mainly a summer dish because it can really only be made from fresh produce. Canned or frozen just doesn’t cut it. That’s because you have to cook the various vegetables together so they can talk to each other and get acquainted. If you just bung them all in the pot, already cooked, they won’t have much to say when you dish them up. There is heated discussion among French chefs as to whether you peel the vegetables or not, whether you cut them up into large or small pieces. Whether you cook them separately and then finish them off in the same pan, or whether you cook them together from the start. But one must is that you stew them rather than fry them. There’s also conflict as to which herbs to use. Julia Child uses only parsley. Raymond Oliver uses a blend of fines herbes. To my mind, you can’t make a ratatouille worth eating without at least thyme and preferably a bay leaf or two. One huge advantage of ratatouille is its versatility; you can eat it hot or cold. And if you choose to eat it cold, another advantage is that you can make it in advance. Hot, it goes perfectly with grilled fish or simple meat dishes: roasted or broiled beef, lamb or especially chicken. Cold, you can serve it with cold meats or spread a bit on toasted bread to make bruschetta appetizers. Everyone has their “correct” way to make ratatouille. This is mine. I prefer it not to be totally cooked down and mashed, as does Fernand Point, unless you’re going the bruschetta route. Which is why I follow the niçoise tradition of not peeling the zucchini. I figure they should know because they invented this dish. I also like the eggplant to keep its shape, so I straddle the fence on peel vs unpeel and like to peel it only halfway, in a striped fashion; this also is more colorful, but it’s not recommended if the eggplant skin is thick. Before you start cooking, scald the tomatoes to peel them, then remove the seeds and cut them up into large pieces. You can blanch the peppers so they’re more digestible, if this is a concern, but always remove all the seeds and membrane, then slice them and cut the slices in half lengthwise. Scrub the eggplant and zucchini. Half peel the eggplant lengthwise so that one stripe is white and the next purple, then cut it into large chunks. Cut the zucchini into slices about as thick as the eggplant. - Slice the onion thinly. Cook it, stirring at regular intervals, until it’s translucent but not browned. Remember: ratatouille should be a stew, not a fry-up. When the onion is almost cooked, add the peeled garlic (either whole or pressed) and cook for about 2 more minutes. Put these ingredients into a large bowl while you cook the other vegetables. 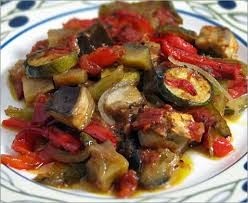 - Using the same olive oil, cook the eggplant about 2 minutes, then add the zucchini and cook another 3 minutes. Strain off the olive oil, which you can save to make a deliciously flavored vinaigrette. Put the eggplant and zucchini in the bowl with the onion and garlic. - Finally, add a few drops of olive oil to the skillet and cook the tomato and the bell pepper for about 5 minutes. - Put all the vegetables back in the skillet. Add the thyme and bay leaf. Salt and pepper to taste. Turn the heat down low and cook covered for 10 minutes. Then remove the cover and turn up the heat a bit, basting with the juices several times. Be very careful here not to scorch the vegetables in the pan. When only a few tablespoons of the juice is left, you’re done. If you reheat your ratatouille, do it over very low heat. Some recipes that specifically call themselves rataouille niçoise list fennel among the ingredients. If you choose to do this, then use 1 head of fennel and cook it with all the other vegetables. Some cooks just add a touch of fennel seed after they’ve cooked up the vegetables. If you really don’t have the time (or the inclination), I guess you could drain a can of peeled tomatoes and just stew all the vegetables together, once the onion is cooked. It won’t be as good, but it’ll still make a tasty change from the usual accompaniments. The Boulevard de Rochechouart is the southern boundary of the Butte Montmartre. Along it, several small movie theaters provided a moment of escape for generations of humdrum lives. With the change in the urban population and in its leisure habits, especially with the advent of television, one theater closed and was transformed into a mini-mall of cheap clothing shops. Another - the Trianon, once a popular music hall - limited its programming to only spaghetti westerns and kung-fu movies. And the third, the biggest, and nearest to what has become the Arab Quarter, took to showing Arab movies. That was the Louxor. 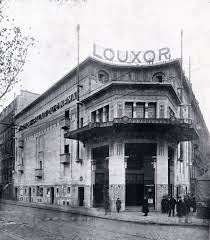 The Louxor - “Palais du Cinéma” - is a citadel of cinema that has lorded it over that corner since the very start of those Roaring Twenties. It looms where a department store once stood. Crowds poured in as soon as the doors opened on October 6, 1921. The huge theater had an orchestra section and two balconies and could seat 1,195 people... who were allowed to smoke as they watched the silent movies, often accompanied by a full orchestra. Newsreels and sometimes live acts were included in the price of the ticket. It was an immediate success. In 1930, French film giant Pathé took over the Louxor and covered its neo-Egyptian decor with neo-Greek furbishings. By then, talkies were the thing and all the hit Pathé films played there. But the neighborhood and movie-goers gradually changed, and in 1954 the theater turned to B-movies to bring in a crowd, a solution cheaper for both Pathé and its clientele. In the 1970s the once regal theater slipped down yet another peg... or five. The audience was no longer French and programming switched to Indian or Arab films, with or without French subtitles. In the dark theater, drugs were sold and ladies of little virtue plied their wares in competition with the film. The bathrooms were also very... popular and there was a constant to-ing and fro-ing up and down the aisles while the film played, according to one ex-manager from those hectic days. But in spite of that, the Louxor was classed as a Historical Monument in 1981, thanks to its decor, and that saved it from demolition. Finally, in 1983 its career as a theater came to an end with its sale to Tati (see above). Plans were to group their various shops into one building but they couldn’t make it work architecturally for the money they were willing to shell out. So after two years they cut their losses and sold it. That was followed by another two years of reprieve as a discothèque - La Dérobade - and then a gay discothèque - Megatown. But even that wasn’t working. In 1987, Megatown closed and the once-mighty Louxor turned into a sort of cinematic Sleeping Beauty. 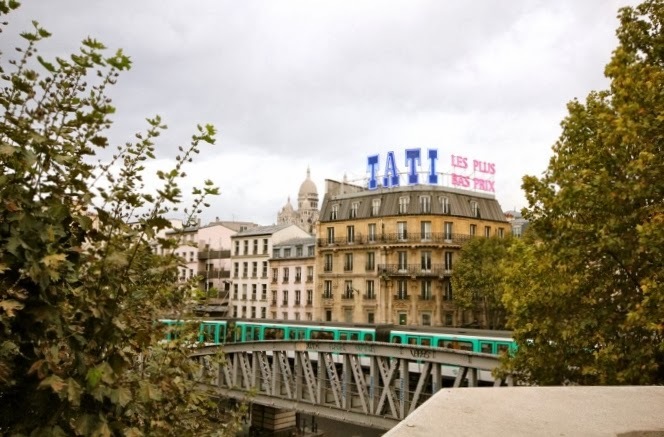 Until 2003 when its Prince Charming in the guise of Paris mayor Bertrand Delanoë bought it with the firm intention of restoring some of its past splendor in a neighborhood Paris was trying to rehabilitate. Delanoë’s personal interest in the building probably dates back to the 1980s and his days as a député, (the equivalent of a British MP or an American Representative) for the 18th arrondissement just across the elevated Métro tracks from the theater. I remember seeing him frequently at events at the sports facility where my children trained in gymnastics. But the job was too big even for a mayor, Prince Charming or not. It took seven more years to pull funding and a crew together. Renovation work began in 2010. One major hurdle was that the building had been closed for 26 years. During that time, its facades served as billboards for elections and the city’s daily power-washing to remove the campaign posters also removed the glittering mosaic work. It was a time-consuming, detail-oriented labor of love to replace them, filled with almost insurmountable challenges. But finally the Louxor reopened on April 18, 2013. So far it’s been a success. That’s largely due to a multipurpose approach. In addition to the Art et Essai art-house movies, it shows reruns of epic films. ("Jaws" and "Saturday Night Fever" are slated soon.) There are classes on the cinema and even festivals. The theater management also works closely with neighborhood schools and offers a movie series for children, with animated and PG films from around the world. Special “meet the director” events are also on the schedule and the three rooms can be rented out for events. There’s a bar on the top level, complete with Art Déco light fixtures, but only for movie-goers. It’s open from 4 to 10 during the week, and earlier on week-ends. And there’s a lounge on the middle level, with Comfy Chairs (and sofas) that would do Monty Python proud. Another reason for its success lies in breaking up the one large auditorium into three screens, to allow it to operate as a mini-multiplex. The largest of the three was restored to its original 1921 neo-Egyptian decor and has been named after famous Egyptian director Youssef Chahine. Screen 2 has a starry sky ceiling and is meant to represent the Valley of the Kings. Screen 3 has a vaulted ceiling and is decorated in red tones. Another Art et Essai theater a little farther up the Butte and to the west is the Studio 28. I wrote about it in a blog on Feb. 6, 2012. It opened seven years after the Louxor, but has been operating continuously ever since. Both have their charm, but the Studio 28 is an intimate setting, whereas the Louxor... well it was intended to be monumental, just as the Pharaohs would have wanted. And the City of Paris has done an excellent job of making that a reality. For a video of the theater and the renovation work, go to the link below. It’s in French but the images tell the story just the same. If ever there were a tragic figure for many people, it would be Mary Stuart, mostly because of her execution by order of her own cousin, Elizabeth I, Queen of England. But that wasn’t the only sad thing about the life of the Scottish queen. Like Eleanor, she was imprisoned. Like Anne, she was shuttled back and forth like a prize. 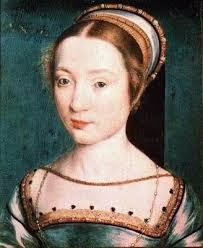 Born near Edinburgh to King James V, Mary was also the great-niece of Henry VIII and a Tudor on her grandmother’s side. That alone was to poison her life. Add to it the fact that her father died when she was only six days old and she became Queen of the Scots in title, although the country was ruled by regents until she became an adult. In the meantime, what to do with Mary? Her mother was French and thought - not totally without reason - that the Scots were a rowdy bunch compared to her well-mannered compatriots back home. If she had to stick around cold, dark, gloomy Scotland to look after Mary’s royal interests and ultimately act as regent, at least her daughter could escape and go learn some of those Gallic manners so befitting of a queen. It would also get her out of reach of the English king, who wanted her for his son in order to swallow up Scotland. (Is this sounding familiar yet? Remember Anne de Bretagne?) Just a baby and already a pawn in the power game. So at the age of 5, for all those reasons, Mary was sent off to France, England’s hereditary enemy. She arrived at Amboise Castle in the Loire Valley with an entourage of young Scots, probably not only to wait on her but also to remind her where she came from. 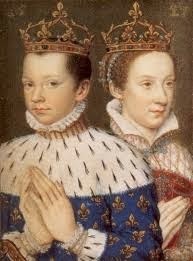 The French king’s plan was to marry her off to his eldest son, François, so that he could swallow up Scotland instead of Henry. Not much concern was wasted on what Mary wanted. In the French court, everyone loved the vivacious girl. Everyone except the queen, grumpy old Catherine de Medici, who didn’t like anyone very much except her own children, and even then not her daughter. Mary could sing, write poetry, play the lute, hunt to the hounds and speak six different languages. But her couple was mismatched from the start. She was tall and beautiful; François was painfully short and he stuttered. 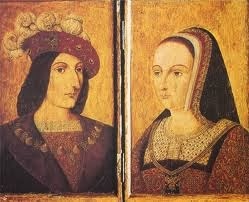 Still, Mary kept her side of the bargain and married him, thereby making him King of Scotland. She was 15 and he was all of 14. 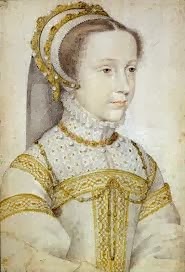 Mary also signed a secret paper, bequeathing Scotland to the French crown if she had no male heir... and also signing over her claim to England, which must have made the French king ecstatic. It was something France had been after for centuries, ever since Eleanor of Aquitaine, and even before. Everything was happy during her childhood and youth in France. And then the clouds massed on the horizon. Mary’s mother died when Mary was 18. Only a few months later, her husband died of an ear infection gone bad. There was no longer a place for Mary at the castle and she sailed back to Scotland grief-stricken nine months later. From then on, things went downhill. Protestants were pitted against Catholics in her homeland. Queen Elizabeth across the border increasingly distrusted the intentions of this beautiful cousin. Mary wed Lord Darnley, and then he was murdered. The only bright spot was her son, James, who eventually became King of Scotland and, after childless Elizabeth’s death, King of England. Mary wed yet again, this time to someone the Scots hated. They threw her in prison, where she miscarried twins, and then she was forced to abdicate. She managed to escape and fled over the border, not realizing how much Elizabeth feared her as a rival. After two decades in England, squabbling and plotting, Mary was taken prisoner and executed. Elizabeth claimed she had never given that order. Even in her last moments, Mary was tragic. It took the executioner three painful strokes to chop her head off. When he held it up by the hair to show the crowd, her wig slipped off and her head fell to the ground, revealing short grey hair. Mary was only 45, but life had aged her prematurely. All the promise of her sunny youth in France was long gone, and even her request to be buried there was refused by Elizabeth. Instead she was buried secretly far from Scotland, but later exhumed and reburied in Westminster Abbey by her son James, once he inherited the throne from her cousin and enemy. A sadder life than Mary’s would be hard to imagine. Sometimes being a Double Queen is just double the heartache. Like Eleanor of Aquitaine before her, Anne had the good fortune to be born in a place - the Duchy of Brittany - where Salic law didn’t apply and women could reign, provided there were no men left in the bloodline. And that was the case when Anne’s father died. She was only 11. Like Eleanor, she was given a good education, as it was obvious she was going to inherit the duchy some day. And also like Eleanor, that made her the wealthiest woman of her time in Europe. Her wealth attracted the attention of suitors of the political persuasion. Anne’s father had not wanted Brittany to be swallowed up by France so he officially betrothed her to Edward, Prince of Wales. She could have become Queen of England as well but unfortunately, poor Edward was “disappeared” before he could be crowned. So was his brother - the two young Princes in the Tower taken under their uncle’s “protection” (read “imprisoned”), an uncle who then succeeded them as the ruthless King Richard III of England. Another of Anne’s suitors was Maximilian of Austria, the Holy Roman Emperor. He got farther than poor Edward, marrying her by proxy. But the French king, Charles VIII, refused to have Maximilian hem France in on both the east and west borders. Charles “the Affable” he was called, but not when it came to his enemies. He forced Anne to repudiate the marriage... and marry him instead. The marriage contract they signed was a strange document. It said that whichever of the two spouses outlived the other would retain possession of Brittany, which seems fair because she was only 13 and he was only 21. But just in case, and to be sure France retained Brittany within the kingdom, the contract also stipulated that if Charles died without a male heir, poor Anne would have to marry his successor. Seven years passed and all four children born to the royal couple died in infancy. Then one day at Amboise Castle, Charles was hurrying to see a tennis game and stupidly hit his head hard on the stone lintel of a doorway. He watched the game... and then fell into a coma and died within hours. Anne was only 21. As per the marriage contract, Anne got to keep Brittany, but she was also supposed to marry Charles’s cousin and successor, Louis XII, and hand it over to him. There was only one small problem: Louis was already married... and to the sister of her late husband. In an attempt to retain Brittany, she agreed to honor her obligation, provided Louis could have his marriage annulled within the year. Annulments were not easy or fast to get, and Anne confidently returned to her beloved Brittany to rule it as Duchess. But Fate intervened, the Pope dissolved the marriage under political pressure, Anne married Louis and Brittany was never again free of French rule. Unlike Eleanor who complained she had “too many sons”, Anne had none that survived, either with Charles or with Louis, who perhaps would have achieved better results if he’d remained married to his original wife. Anne died at the tender age of 37, the last independent Breton ruler of Brittany, having dedicated her short life to protecting the autonomy of her beloved duchy within the kingdom of France, an amazing balancing act in an era where women had no power of their own. The French are very proud of their lamb. And rightly so. 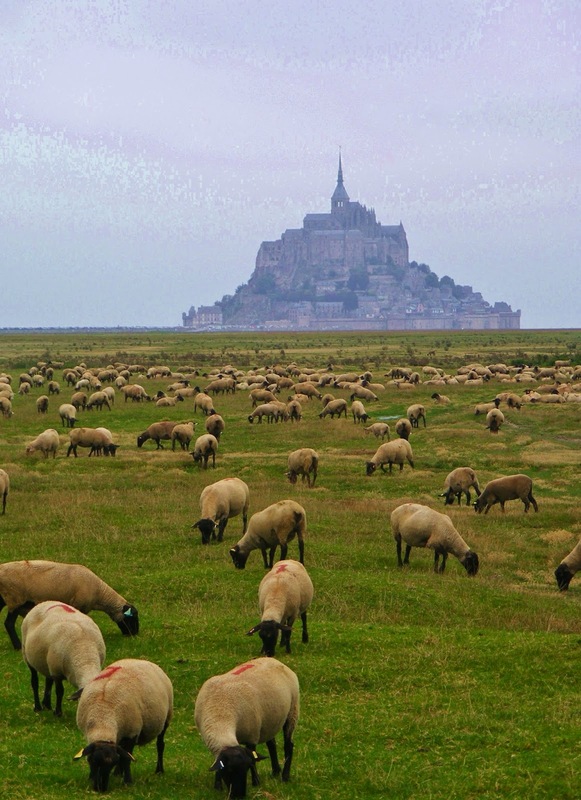 There’s little as delicious and succulent as a lamb that’s been fed on the pré-salés, the salt meadows around Mont St. Michel that are under seawater when the tide is high, giving them a delicate, built-in and all-natural saltiness. Some of the best I’ve ever eaten was a leg or shoulder of lamb with cloves of garlic tucked into little incisions and then oven-roasted until the skin was golden and crisp. And then there’s méchoui - a whole lamb on a spit over a fire pit that is slow-roasted all day, al fresco, a tradition repatriated from the ex-French colonies of North Africa. It’s been a cold start to the year so spring vegetables are running a little late. And Easter is over. But so what? Let’s prepare some lamb with new spring vegetables anyway. It’s a dish of wonderful things that are at their prime in this season. If you want to make this more of a provençal dish, just after you’ve sautéed the onion, add some fresh tomatoes, skinned, seeds squeezed out, and the tomato “meat” cut into 8 pieces. 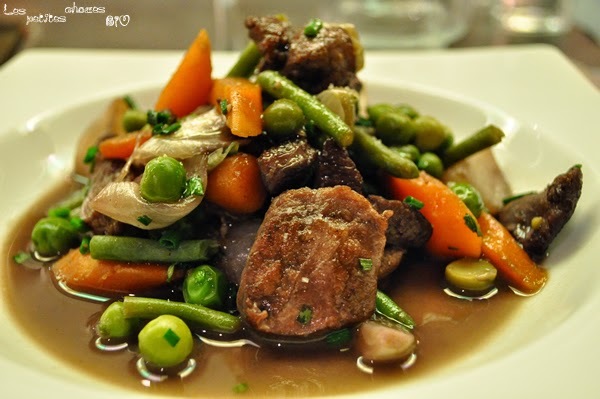 The perfect wine to go with “the delicate flavor of young spring lamb”, according to Julia Child, would be a Bordeaux-Médoc. 2000, 2003 and 2010 were all good years. - In a skillet, sauté the lamb pieces in ½ butter ½ olive oil until they are well-browned on all sides. Put the lamb into a large stew pot or Dutch oven and sauté the onion in the same pan you used for the lamb. - When the onion is translucent, add in the whole cloves of garlic, letting them cook for just a minute or two. (Garlic contains a lot of sugar and it burns very quickly.) Put the onion and garlic into the Dutch oven with the lamb.